I feel like painting a anything in your house is the easiest way to add DIY-er to your resume. Seriously though, if you can paint, you’re basically a DIY-er. See how easy this is? And its such a fun way to make a bold statement at a very reasonable price point. 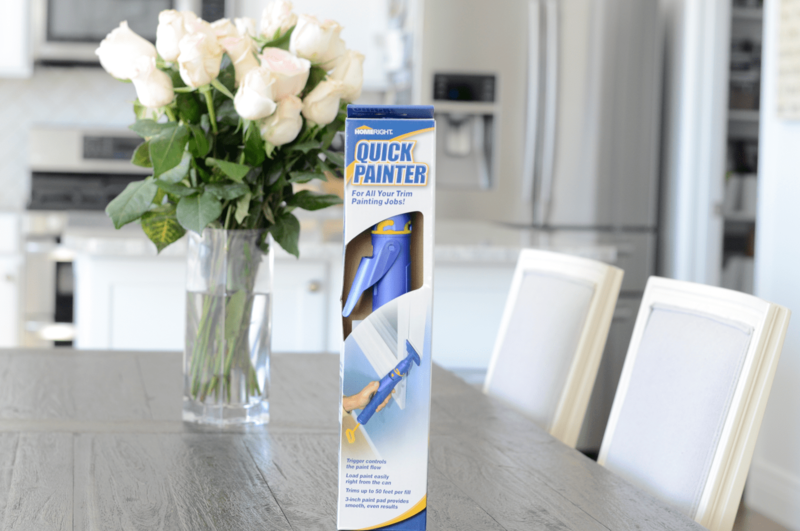 I have recently teamed up with Sherwin Williams (they make amazing paint products) and Home Right (they have brilliant paint gadgets that make painting a breeze) to show all of you how to paint a perfect accent wall WITH perfect paint lines!!! 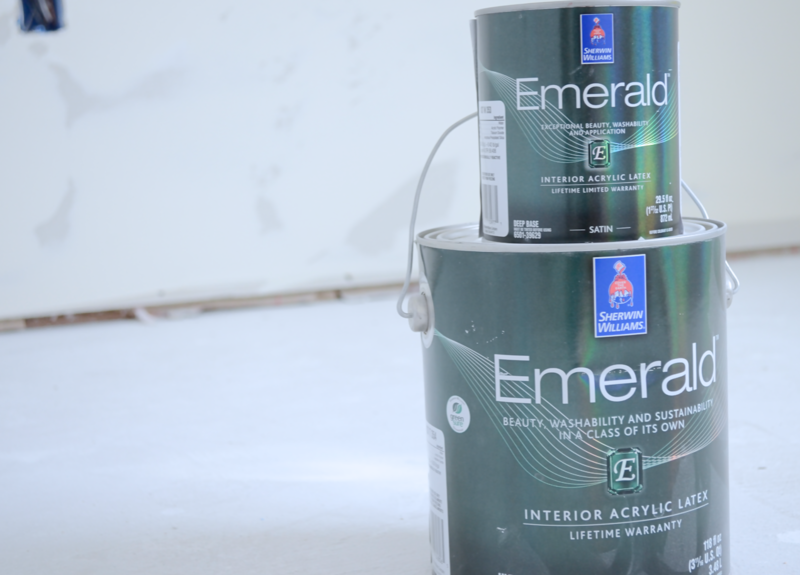 For perfect paint lines there are a few steps and tools that will make it so much easier to get great results. I LOVE Frog Tape for paint projects because it works better than any tape I’ve tried thus far and it rarely removes paint off of the wall its taped to (I’ve had lots of trouble with other tapes, its kind of a sore subject.) Make sure you use a towel and rub it over the tape to get a good seal, remove any air bubbles and this will reduce the paint bleeding. Are you ready for the BIG SECRET!? Here it is! I actually got this tip from DIY Queen Mandy Gubler of Vintage Revivals and its legit! 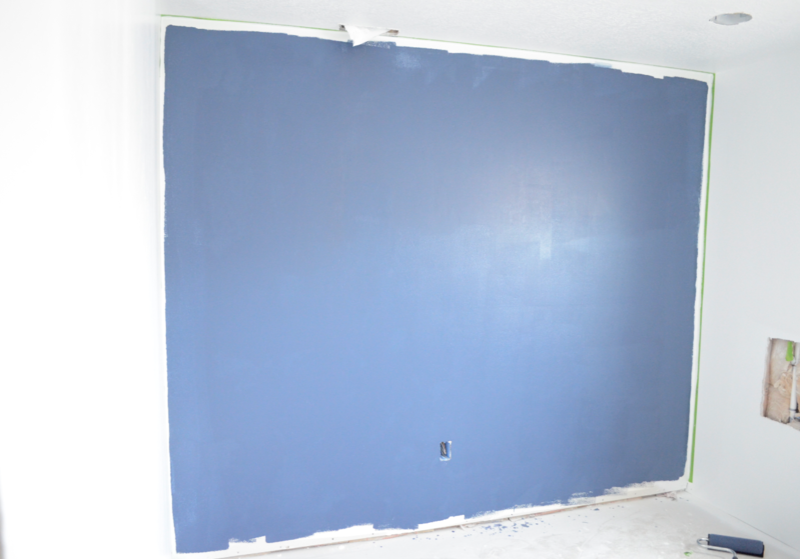 Before you paint your new wall color, use the existing wall color (the same as the wall that has the tape) and paint it with a brush where the tape and wall meet. The reason this works is because the paint is 99% almost always going to bleed through, even with good tape. 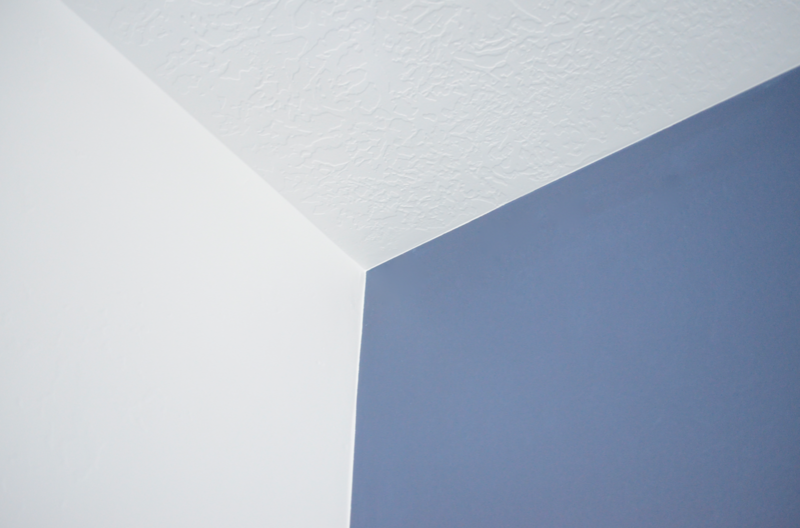 If you paint the existing wall color, that is the color that bleeds through and when you take the tape off you’ll now have a PERFECT paint line. If your not super picky and you don’t have to have a super crisp line you can always use the edger tools carefully and have a very close line. I have a slight addiction to perfection (I realize its never going to be obtainable, hence the addiction) so I do both, mostly to keep my work space clean, and minimize hitting the other walls with paint. 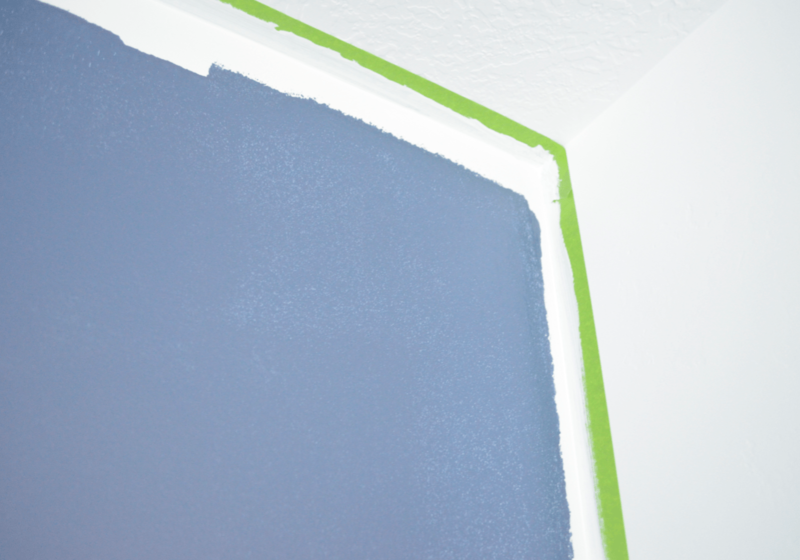 Once you finish painting the edges of the tape go ahead and start rolling your first coat of the accent wall color. This will give the edges time to dry so you can keep working without having to put paint away so it doesn’t dry up. Now its time to use your edger tool. Start over the dry (existing) paint and paint the new color making sure to fill in all the nooks and crannies. 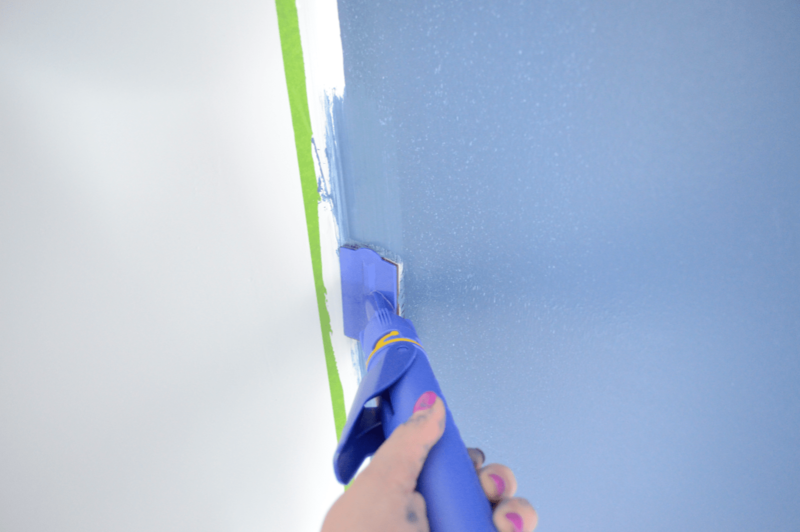 I LOVE this Quick Painter edging tool from Home Right because it actually holds paint on the inside, so cool right?! You push that lever and it lets paint come out. This was sooo nice, in the past I’ve used other edgers that made it hard because you had to dip it into the paint every time. Trust me, you want this edging tool as part of your regular painting supplies! Now that you’ve painted the first coat with the edger its almost time for another coat with the roller. 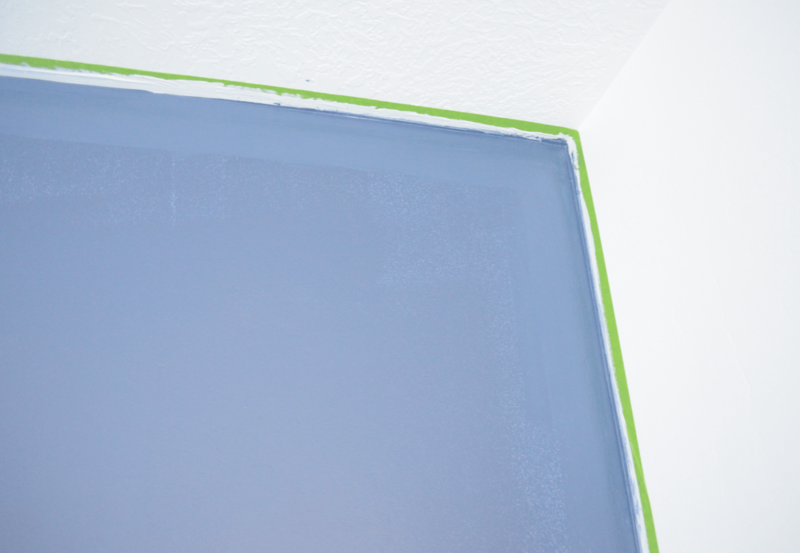 Just make sure the paint it dry to the touch before painting the second coat. 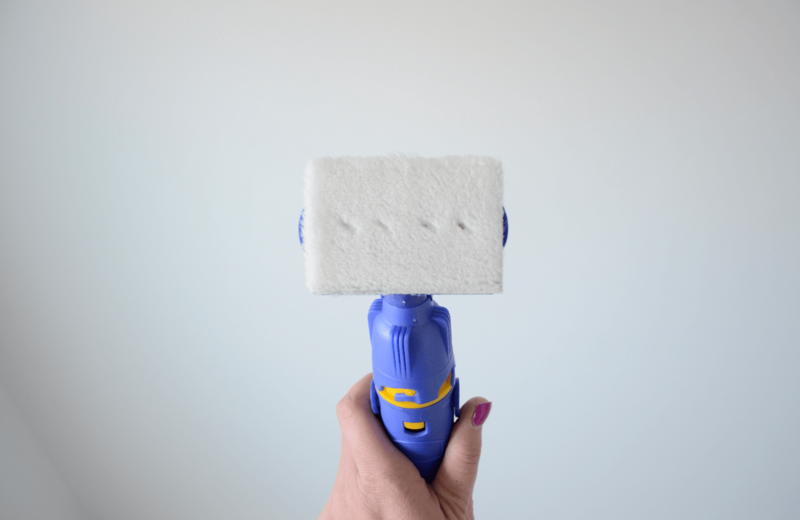 Paint your second coat of the main wall with the roller and finish with a second coat with the edger. Once everything is dry to the touch, carefully remove the tape. You should be left with a beautiful and near perfect line, like so. This space is just one room in our unfinished basement that should be all finished in the next couple of weeks! Stay tuned for some big room reveals coming soon as we finish the floors, doors and baseboards! I’m so excited! And I figured some of you would want to know what the name of this color is, so here it is. 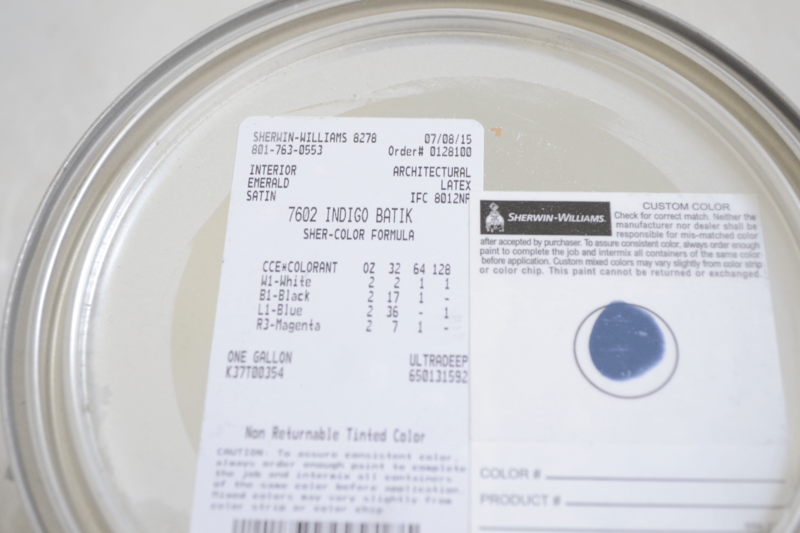 Indigo Batik by Sherwin Williams. What colors are you wanting to add to your home? Disclosure: I received the paint from Sherwin Williams and painting tools from Home Right as compensation in exchange for my post. All views and opinions are 100% my own. 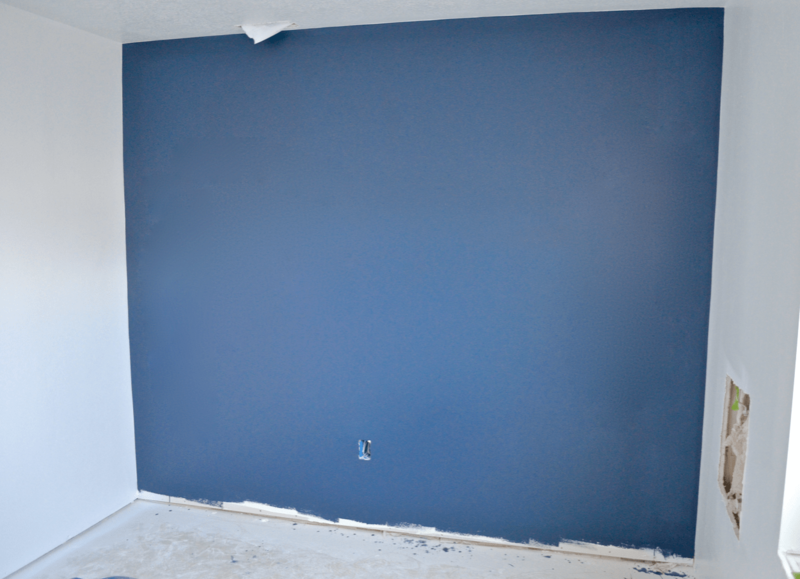 I love the tip to paint the other wall color first!! My husband and I had pretty much given up on taping before painting because it is a pain and it always bleeds through!! We are almost all done redoing our house but if we do have another wall to pain in the future I am so going to use that trick! It seriously WORKS! I’d love to hear how it goes for you!